The scarcest talent in American business is great public speaking, yet it's the one that delivers the biggest rewards for your company and your career. Doubt it? Consider Jeff Bezos telling us about Amazon's latest reach, or Elon Musk giving us alook at the future of everything. These are celebrity C-suiters, but there are other strategic public speakers who drive company and career success on a smaller stage. Consider the CFO who makes data come alive in understandable and interesting ways, the COO who doesn't talk about logistics but rather tells an awesome story about a cereal's journey from wheat-field seedling to the breakfast table of a busy Atlanta family, and the pharmaceutical CMO who skips the unpronounceable chemistry and takes us straight to a now-achievable lifestyle in which age is an irrelevance. Here's the good news: these communication masters weren't born that way. Impactful public speaking is a learnable skill for anyone who has the drive it takes to make it to the C-suite. However, there is a challenge. 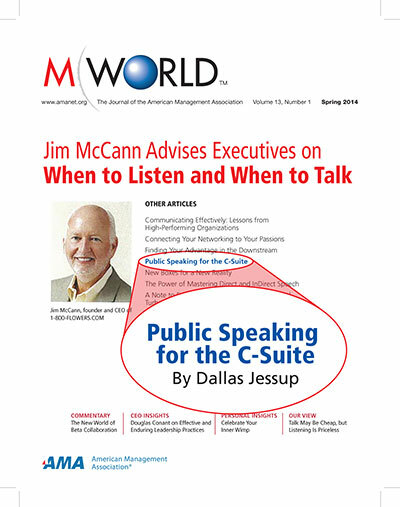 While the return on exceptional public speaking is significant, the rules have changed in the past few years. For those who want to harness this powerful career and corporate tool, there are eight essentials for creating and delivering a compelling speech that will ensure a home run every time. Prior to the Internet's ubiquity, most people were exposed to very few speakers, including politicians speaking on television, conference lecturers, and a handful of others. Today, our expectations of public speakers are raised, and the bar is much higher for a presentation to be judged as exceptional. Why? Two words: TED talks. Twenty years ago, Chris Anderson set out to put the world's most intriguing people onstage at semiannual TED conferences. The speakers included scientists, educators, writers, entertainers, mad geniuses ... people with really, really big and game-changing ideas. Since that time, hundreds of amazing people – including Malcolm Gladwell, Bill Clinton, Richard Branson, and other great communicators – have appeared at TED conferences each year. TED talks are available online for free viewing, and because of the exceptional content, entertaining format, and 18-minute time limit for each talk, TED's website has become one of the Net's most popular. What does this mean for you, the fledgling speaker? Your audience has seen the best, and they now expect and hope for something similar from you. It's the new standard, and you should embrace it. You can and should watch 10, 20, or more best-rated TED talks to get a feel for exceptional speaking in terms of content, presentation, and delivery. You can up your game by seeing how others do it. Want to truly excel on stage? One secret is to know that visuals are content, as important to the presentation (if not more so) as your words. Visuals are one difference between adequate and extraordinary public speaking. Be assured, we're not talking about the wordy, bullet-heavy slides that are vestigial corporate artifacts from the '90s, but rather something much more. As you will notice among the best of TED, visuals should be nothing less than graphic representations of thought that deliver or enhance your message. Remember the adages "A picture is worth a thousand words" and "Don't tell me, show me"? Keep them in mind as you spend ample time preparing this critical element of your talk. You need to select photos, build infographics, capture screenshots, create graphics, and choose thefew words that go with each. The great news here is that help with visual-content creation – from social media templates, SlideShare or PowerPoint® software, and other tools – is just a search away. Populate these templates with images from stock-photo sources such as Getty Images, iStock, and Corbis, and your visual content will become truly engaging. Finally, limit the number of words on each slide. The graphic should speak for itself. No more othan 5 to perhaps 10 words – and, in some cases, only a word or two – are necessary. Social media works well because it allows you to use an illustrative newspaper headline or an amusing or impactful photo to make or reinforce a key point. Every speaker should know what he wants his audience to do, and making this action happen is the goal of a presentation. Otherwise, the speech is empty rhetoric and a wasted opportunity. So what do you want the audience to do? Are they analysts you want to tout your company's stock? Philanthropists you hope will write substantial checks to a nonprofit? Vendors you hope can do more for less? Whatever your goal, you will need to make the "ask," and that request comes in your conclusion. However, you should write out a tentative conclusion to your presentation as the first step in preparing your talk, keeping the action you want to encourage firmly in mind. Tell your listeners exactly what you want them to do, and remind them of the points you made in the body of your talk that are compelling reasons for them to take your recommended action. Now that you have a clearly defined target, you can easily select the main points that will become the framework of your speech. Your preparation will be more efficient because you can evaluate each point or graphic by how much and how well it leads to your final goal. Speakers often are the most experienced and knowledgeable people in the room in their area of expertise, and they could discuss a dozen important topics in depth. Average speakers typically touch on multiple topics to give the audience the greatest amount of information possible. Although their intention is good, this strategy prevents them from delivering a clear and compelling narrative and argument for action – the goal of an effective speech. Exceptional communicators understand that if you try to do too much, you get nothing done. They focus on one important message or theme, and that message defines the structure of their talk. Every story, piece of evidence, point of argument, and slide must support that single message or theme. When these speakers make the final "ask" in their conclusion, they are definitely more likely to be successful because the audience was alerted early to the primary theme and easily followed the message. You can only accomplish so much in one speech. Try to do more, and you'll accomplish little, if anything. When you focus on one message, your effectiveness will be assured. No matter how exceptional their message and delivery, the most impactful speakers go to work well in advance to create optimal conditions for a presentation. So should you. Ninety-five percent of business and civic programs go on way too long. An overzealous meeting planner adds too many speakers, and one or two always go well over their time limit. Yet speakers don't plan ahead for these realities. To get the best possible audience, you must take the critical step when you're first booked of negotiating your position on the program. Never be first, no exceptions. People are busy, especially those in business, and your audience will be too. Twenty percent of your audience will still be in the hallway when the moderator tells everyone to take their seats, and they will enter disruptively after they complete their phone call, finish their coffee, or conclude their conversation. Others in the audience will still be getting settled when you take the stage. Similarly, you absolutely do not want to be last on the program, again because people are busy, the meeting planner was not effective, or the event will run overtime. Attendees leave, often disrupting the final presentation. The attention of the remaining audience members is exhausted, and many people are looking at their watches. The likelihood that you will deliver a great and well-received speech plummets. Do whatever you need to do, such as claiming immovable schedule conflicts, to get a good position on the program when you're first booked to speak. This step will turn the odds of a successful speech in your favor. While 45- to 60-minute speeches were the standard in decades past, it's now a 140-character world. We want our information in brief and comfortably consumable measures. Audiences expect more information or entertainment per minute, and our collective attention span has shortened as speakers, the media, and online sources have modified their format to serve this new audience expectation. Don't fight this trend. Embrace it. Isn't it more exciting to answer questions from an audience that is excited and intrigued by your 21-minute message than to receive a polite tennis clap after delivering a yawn-worthy, hour-long message? Here's your best strategy: always leave your audience wanting more. Finish 5 or 10 minutes before they expect you to, and they will love you. Respect your audience – and the opportunity every stage offers – by preparing for the speech.We aren't talking about dusting off last year's Power Point and making some notes on the plane. It takes a couple of weeks, at a minimum, to put together a solid 21-minute talk, and every great speaker will tell you that he or she invested an hour of practice time for each minute onstage. Many then take the extra step of using a coach or another independent party to get an honest evaluation and recommendations for fine-tuning the message and its presentation. Don't accept a speaking engagement unless you're ready to make this level of commitment. Great communicators drive company success and have high-trajectory careers. Stage time is a priceless opportunity to show your greatness. Don't wing it. Scores of books are available on public speaking, and they can teach you the value of storytelling, how to populate your stories with real people, the importance of audience engagement, why authenticity trumps perfection, the fundamentals of tone and timing, and many other lessons. The art of public speaking requires continuous learning, and your professional schedule and personal reading should permit time to master this skill set.